Our family spent the first week of August making multiple trips to the Ohio State Fair. Along the way we picked up a number of ribbons and sweated out the armpits of a dozen shirts. Like last year, Morgan and I snuck away to see some of the sites of the fair that weren't within the four walls of the hog barn. 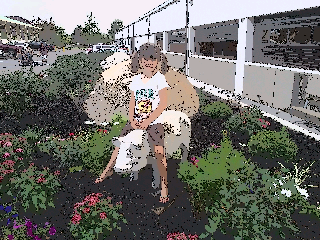 I used a "cartoon" feature on my camera phone to take this photo. Artsy. 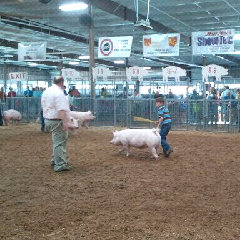 As usual, Ryan was the star of the Michael family pig showing crew. He racked up quite a few ribbons over the week, including champion Landrace barrow (Landrace barrow = white castrated pig with floppy ears). Here he shows his Yorkshire gilt (white female with upright ears). There are probably readers of this blog who would pay good money to see﻿ how I used to get in the ring and show our hogs. Fortunately, I have pumped out enough junior showmen to retire and become chief photographer and water bottle holder, however, it's all hands on deck when we have three pigs in the same class. 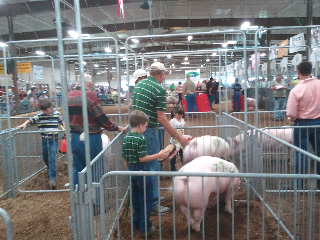 Husband, GrandDad and my Grandpa all are helping the kids get ready in the holding pens (the pens where you go before your class enters the show ring). 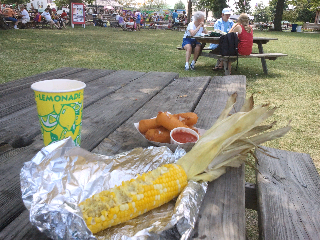 Husband and I very much disagree about fair food. I, like most normal people, look forward to the opportunity to buy something on a stick for every meal. Husband fondly remembers the days when the Ohio State Fair had a Wendy's booth, which he visited at every opportunity. Blasphemy! Our good friends at the Ohio Farm Bureau always put on a great display at the Ag and Hort Building. A few years ago we met a very self-aware cow, who I believe has since retired to a pasture of astroturf. 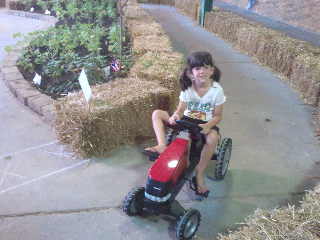 Anyway, we always have fun there and the kids love to ride the pedal tractors. The Ohio State Fair is over now but we are still looking forward to visiting the Indiana State Fair and our county fair. Stay tuned for more fair fun photos and possibly a look back at my time in 4-H (it was the 80s! ).